Safari shots taken in the early morning and late afternoon hours usually produce the best photos of the animals and landscapes. Mid-day photos often lack vivid colors and needed contrast. For sharp photos, don't shoot when your vehicle is moving on a rough road or terrain. And unless you have a good image stabilizer, don't expect crisp photos even when the vehicle is starting or idling. You can also prevent fuzzy photos by not using a telephoto lens in greater magnification than your practiced skill in holding the camera steadily. Keep your camera and lens sealed when not in use - and bring a lens cleaning kit. 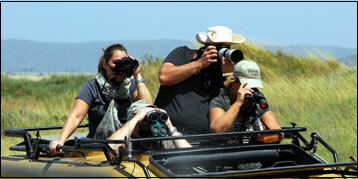 Fine dust is normal on a safari and could cause your camera's circuitry or mechanics to malfunction.